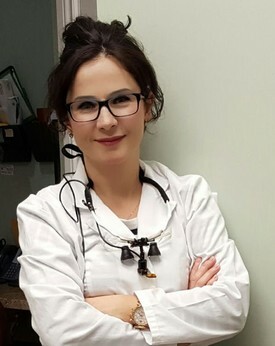 Dr. Marku obtained her DMD degree at University of Zagreb Faculty of Dentistry in Croatia in 2003. After she came to Canada she completed Equivalency Program and practiced dentistry in few dental offices in GTA. In the meantime, she enjoyed taking advanced training through continuing education above and beyond the College requirements, in subjects such as: Dental and Medical Emergencies, Sedation, Oral Surgery, Orthodontics, Implants, and Esthetic Dentistry. She is an active member of Royal College of Dental Surgeons of Ontario and Ontario Dental Association. Today, working at her office, allows her to continue to enjoy her passion in all aspects of dentistry. It gives her an immense pleasure to provide the patients of all ages with excellent dental care in general and cosmetic dentistry. She makes a visit to the dentist an intelligent and fun experience. When she is not at the clinic, she enjoys getting to know new places and cultures and spending quality time with her family. She is fluent in Albanian, Serbo-Croatian, Italian and English.